Looking to renovate your house in Burgundy? FrenchEntrée > Guides to Buying your French Property > Regional Property Guides > Looking to renovate your house in Burgundy? 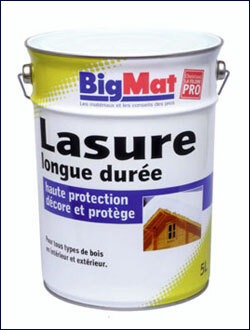 Big Mat building supplies has everything you’ll ever need! Big mat is a family run builder’s merchants in which you will be sure of a pleasant welcome and lots of pertinent advice when it comes to renovating your Burgundy dream home! And with over 17 sites in the Burgundy region you’ll never be far away from one of the many Big mat builder’s yards! In the Yonne and the Côte D’Or departments for example, the 5 sites are situated in the most popular areas of Auxerre, Avallon, St Florentin, St Clément and Epoisses. 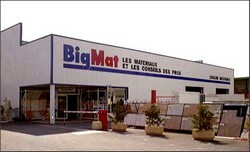 The company was set up by the Gourmand family over 100 years ago and has been part of the Bigmat chain since 1987. A team of over 80 professionals are on hand, covering all aspects of renovation. Over 20 vehicules are available for deliveries in the Yonne and the surrounding Burgundy departments. Their vast range of professional products abide by strict French and European regulations and standards. The mark NF on a building product is a mark of reference in which you can have entire confidence. It denotes a product as having excellent security and quality,it allows the purchaser to benefit from a building product that you can definately trust. 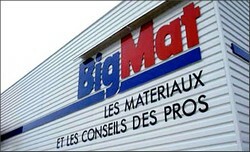 So what products can you expect to find at Big Mat? Big Building Projects Foundation concrete, ciment, facade plaster, limestone ciments , floor boards, concrete blocks, prefabricated blocks and bricks. Wood to build rooves, tiles, slates, cladding, under roofing, onduline, roof windows, gutters, roofing panels. 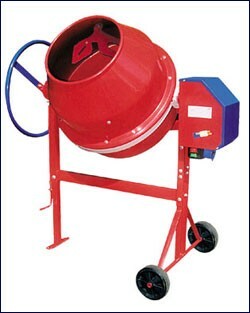 Interior and exterior paints, walls and floors, decoration and protection for wood, decorations, tinting machines. Shiplap, decorative wall panels, plywood, finitions. Entrance doors, windows, renovation joinery, shutters, security protections, blinds, staircases. Automatic gates. Parquets and cupboards. Plaster boards, Fibre glass, Rockwall, extruded polystyrene, roof panels, heat reflective coverings. All styles of kitchen and kitchen equipement. Big Mat can even fit your kitchen for you! Interior and exterior tiling, kitchen and bathroom tiles, swimming pool tiles, terraces and balconies. Its worth noting that you can pay for your goods in 3/4 times at no extra cost or even set up an account and pay later. Big Mat attaches a great importance to the way in which they take care of their clients which guarentees you not only high quality products but also excellent service and advice. Don’t be surprised if the person serving you offers you a coffee!